Iscritto il 2 marzo 2010 sotto il numero 2/2010 del Registro stampa del Tribunale di Varese. The "Protagora" is a magazine of philosophy and culture founded in 1959 by a philosopher and partisan like Bruno Widmar who has always conceived this periodical as a space for free and critical discussion, inserted in the great tradition of international critical rationalism. Resuming and deepening this approach, the magazine, currently directed by Fabio Minazzi, has over the course of its history, more than forty years, has become a privileged point of reference both for the study of contemporary philosophical thought, and also for the deepening of the main figures of Italian, European and world rationalism, being able to make use of an international scientific committee and a co-editor formed by eminent thinkers such as Evandro Agazzi, Fulvio Papi and Jean Petitot. During its history, the magazine has published numerous unpublished writings, or in the first Italian translation, of Italian intellectuals of the twentieth century such as Piero Martinetti, Antonio Banfi, Giulio Preti, Ludovico Geymonat, alongside original contributions by scholars such as Umberto Eco, Evandro Agazzi, Fulvio Papi, Jean Petitot, Umberto Eco, Dario Antiseri, William Lawvere or some classics of international thought such as Edmund Husserl, Moritz Schlick, Martin Heidegger, Paul Ricoeur, Gilbert Simondon, also publishing an important unpublished medieval paper. The magazine alternates miscellaneous numbers with monographic numbers. 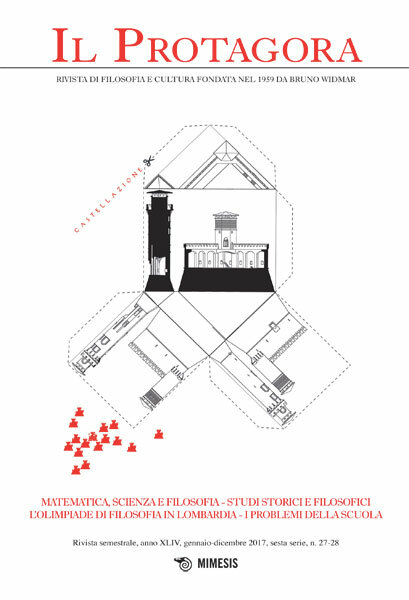 Among the latter there are those on Sixty-eight, on the Contemporary University, on Andrea Vasa, on Albert Einstein, on Gilbert Simondon, on Kant and on the transcendental, on Giovanni Vailati and Federigo Enriques, on Paul Ricoeur, on Piero Martinetti, on the "school" of Milan ", etc. The "Protagora" pays constant attention to the world of school and to the study of historical memory and to the commitment of reason for the critical transformation of the world. This explains his attention both to the tradition of the Resistance and to the fight against Nazism and fascism, and also to the study and protection of memory in order to implement a profound renewal of scholastic teaching.